In this tutorial, we are going to use FXTrade, the Oanda trading platform, as the example. The very first step when imaking your first forex trade is opening the trading platform. Now choose a currency pair and open a chart. Select a timeframe. In this case, we are going to use a 15-minute time frame. Each candlestick on the chart represents 15 minutes of time. For this example, I am going to use the Australian Dollar vs the Japanese Yen, AUD/JPY pair. It is showing a strong downtrend and looks like a simple trade. Now add some indicators to the chart. For this chart, we are going to add MACD and a 200 exponential moving average. 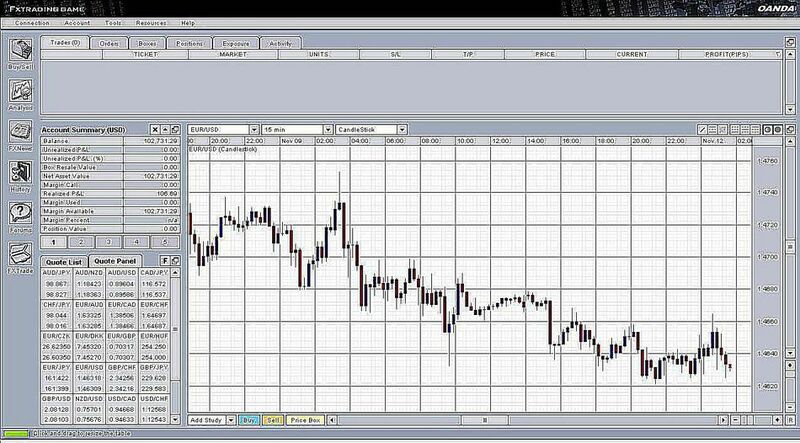 Using technical indicators is an option when forex trading. They are helpful for the decision-making process. The basic rule for using the 200 EMA is if the price is above the line, it is likely to continue higher if the price is below the line, it is likely to continue lower. The price seems to be moving below the 200 EMA line. This confirms that the price is in a stable downtrend. Please understand that if we are selling AUD/JPY that we are buying Japanese yen and selling the Australian dollar. Therefore, will be looking for JPY strength and/or AUD weakness. I am going to use the MACD indicator to look for a confirmation that the price is ready to go down again. The MACD is not always reliable as an indicator when used alone, but when used as part of a larger trading system it can be helpful to pinpoint a possible turn in price. The price seems to be fighting the downtrend a bit, so I am looking for the MACD lines to cross and head down before I make my trade. Now prepare to place the order. I have confirmed that the price is in a stable downtrend so I am preparing to "go short". The short trade is for 10,000 Australian dollars against the Japanese Yen. This is also known as going short 1 mini lot. Now set your stop loss and take profit levels. This step is optional but highly recommended. Experienced traders have found that setting a stop loss at half the pip amount or less than your take profit level can set you up for long-term success. This is because you can be right less than half the time and still come out at the end of the week, month, year ahead if you have a favorable risk-reward. Setting the stop loss will limit your losses if the market does not move in the preferred direction. Setting the take profit level will make sure that the trade exits in profit once the market makes the downward move that is expected. It can be an advantage to set these levels when you place the trade because once the trade is actually in the market, the pressure can make it difficult to make decisions. Submit your order and wait for the confirmation screen. The confirmation is important as is the ticket number because you may need to reference the ticket number if you need to call your broker about the trade. Of course, you don't want anything wrong to happen with execution, but if there is a mistake in execution on the part of your broker you will need to go to them with your confirmation and ticket number so that they can correct their mistake and credit your account back if necessary. Now the waiting period begins. This is one of the more difficult concepts in forex trading. Some traders find it helpful to turn off the screen and get away from the market once they've entered so that they are not constantly fretting over market moves. Either way, sticking to a good risk reward is a favorable approach and whether your stop or take profit order gets hit, you have done your job correctly. Finally, the trade is complete. This trade has resulted in a successful take profit. The take profit level for this trade was 98.00 and the price did reach that level. This resulted in a profit of $63.60. Not all trades result in a profit, and you should take measures to limit your risk on any trade.